I love white couches for many reasons. When I got my white slipcovered couch everyone (not in the blog world that is, you guys know whats going on) told me I was crazy and that it would get dirty and gross in no time. Well, they are/were wrong wrong wrong, it is the BEST thing I have purchased for the house! The number one reason is can be cleaned/bleached/washed/etc.!! We have already had 10+ stains and each and every single one has come out with little to no effort. Just a dab of stain remover, borax, or a TINY amount of diluted bleach for the stubborn ones and it's good as new. Having white means we can clean it and not have to worry about ruining the color- double plus when you live with a messy BF. Second reason is I can change up the look of my family room on a whim. Since I'm design ADD and always changing things up the white couch is fabulous. 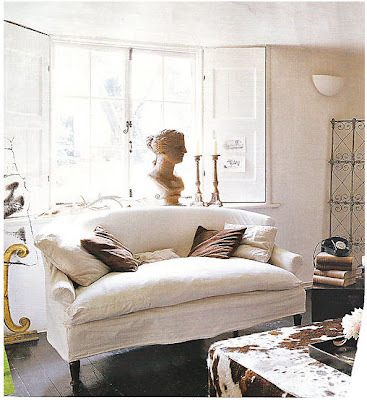 White linen slipcoveres a la Joni from Cote de Texas, gotta love her french style- its beautiful! a quilt, some floral pillows and a white wicker side table and you have a country look. Don't like color? 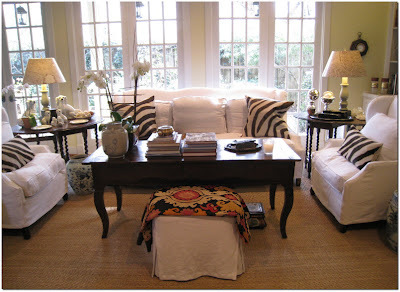 here is a white slipcovered couch in a beautiful black and white room. But, it would be super easy to switch it up and add lots of color. So that is why I bought and LOVE my white slipcovered couch- I would suggest it to anyone looking for a new one. Great post! I'm drooling over all the couches. I'm definitely going white or light tan on my next purchase. I agree, great post. I have 4 white slip covered chairs in my den and just like you everyone said I was CRAZY. But with 3 little pigs they have been a life saver. One wash and they are good as new! Wow, you are totally making me rethink my strategy! And happily so, because I LOVE white furniture, LOVE IT! My one qualm is that I have two black cats... so, could still be a problem with all the black fur everywhere... but, hey that's what dustbusters are for, right? have one myself. love it. easy to clean. and i have two cats and a kid. no probs. Though I adore white sofas,my two dogs and one cat have always stopped me from buying one. Your post might just convince me to take the plunge. Hope that you have a fabulous day! I have one as well and everyone thought I was nutty. I loved getting it, but I have a little pup that likes wiping his face on it! Ah!!!!! Plus one that likes to leave dog hair all over the place. So the sofa gets a daily cleaning and I love it anyway. I've always loved (and feared) white couches, but you've made a convincing argument! I especially love that second pic with the PLEATED slipcover, grasscloth walls and green curtains. Love it! I agree! Almost went with white slipcover. I have 2 of the end tables in the first pic. I use them as coffee tables. From Tarjay! I am so with you! I have one in my studio and I'm always changing the cushions on it too. It's just the easiest thing in the world to decorate with. 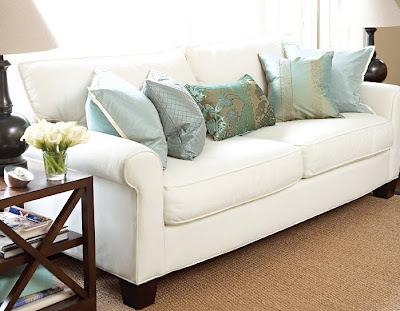 love this post and i always want to get a white couch but never do because I fear it will just show dirt! maybe i should take the plunge? I want one sooooo badly, but just can't decide on the right sofa...it's hard to find one with the right lines (and the right price)! I wish I had one. I'm so jealous of all of my clients that have them. It changes the whole look and feel of a room. Totally agree! Thinking about buying the white slips for my ikea sofa and chair - think I can re-slip them for less than $300 - crazy, huh? I haven't forgotten about the LEB/sabbespot event of the year. I'm feverishly trying to find a job before it starts snowing and I become a total shut in:) Let's plan to get together next month? 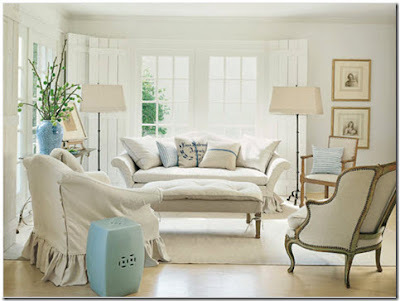 I am with you, I love the white sofa look too and the possibilities for change are endless! I have a BEAUTIFUL white on white stripe curvy sofa in my living room aptly named 'The Marilyn' - oh, how lovely she is. I have 3 small children, a dog, & a cat & the sofa is fine, just fine! I love the second couch - the high arms are fabulous. I love the orange w/the brown in the third pic. I think I need that blanket - can you tell me where that pic is from so I can hunt it down? Thanks! I'm with you...my family thought I has lost my mind when I bought a white Ikea sofa but I love it! Meg....it must be a slip cover...dont' do a regular sofa in white!!! beautiful pics!!! i couldn't agree more!!!! Love those photos, esp. the first one. We have cream microfiber chairs, and so far they've resisted cat barf and red wine! Wish I'd thought to get the same color & fabric when we bought our couch (two years before the chairs). I want a white sofa in my family room! People think I'm crazy because I have three boys, but like you said it's easy to clean. And what about people who have dark colored furniture that can't see the stains that well eewww!! !